REVIVE Music is proud to release “Soul Vibrations”, the first single off Brandee Younger’s sophomore CD “Wax & Wane.” Elevating the harp from orchestra pit to center stage, “Soul Vibrations” presents a luminous patchwork that stitches cascading sheets of sound and pulsing arpeggios with the thread of tribute. “Wax & Wane” will be available for pre-order on January 22 and officially released on February 19. The premiere of “Soul Vibrations” can be heard on Revive-Music.com. On “Soul Vibrations”, producer Casey Benjamin reimagines the Sun-Ra inflected original penned by the late arranger/composer and bassist Richard Evans. Reharmonizing the bassline, Benjamin launches the tune into another dimension without sacrificing the soul first imparted by the celebrated producer responsible for piloting a number of Dorothy Ashby recordings on the Cadet label, including Afro-Harping and The Rubaiyat of Dorothy Ashby. “I want listeners to walk away with a different perspective on the harp’s place in music. For people to know that the instrument can play a fully functioning role in many settings,” says Younger. On “Wax & Wane”, which was recorded at The Breeding Ground in Brooklyn, NY, Younger presents the harp in a completely modern context where flutist Anne Drummond and saxophonist Chelsea Baratz’s Younger’s beautiful melodic lines flow above a pulse of unrelenting funk courtesy of guitarist Mark Whitfield, bassist Dezron Douglas and drummer Dana Hawkins. The official release of “Wax & Wane” will follow an album release concert on February 17 at Dizzy’s Club Coca-Cola in New York City. Evoking the musical equivalent of rare gems, Younger emerges from the legacies of Dorothy Ashby and Alice Coltrane as she ushers in a new era that celebrates the unsung titan of string instruments. Born during the REVIVE Music and Blue Note Records sessions for “Supreme Sonacy Vol. 1,” Younger’s latest album is a testament to her musical forebears that fuses classical technique with the persistent groove at the core of the Black music canon. Produced by Casey Benjamin, “Wax & Wane” features flutist Anne Drummond and long-time members of Younger’s quartet, tenor saxophonist Chelsea Baratz and bassist Dezron Douglas, who trades in his upright bass for electric. Joining them are drummer Dana Hawkins and esteemed guitarist Mark Whitfield. Celebrated string duo Chargaux joins Younger for the project’s interludes. With “Wax & Wane,” Brandee Younger is poised to take her place as a sonic tour de force and the latest innovator in a lineage of groundbreaking musical agitators leading to the rise of the harp. Spiritually transcendent and perennially fresh, “Wax & Wane” strikes a delicate balance between pushing the envelope and flat out breaking the mold. “I wanted to place the harp in a totally different context than what listeners are generally accustomed to and continue to position the harp in way that’s relevant today,” says Younger. With this seven track collection, Younger presents an altered universe where the fluttering polyphonic exchange of the harp and flute expand and contract against a dense rhythmic display. Visit Revive-Music.com for more information. 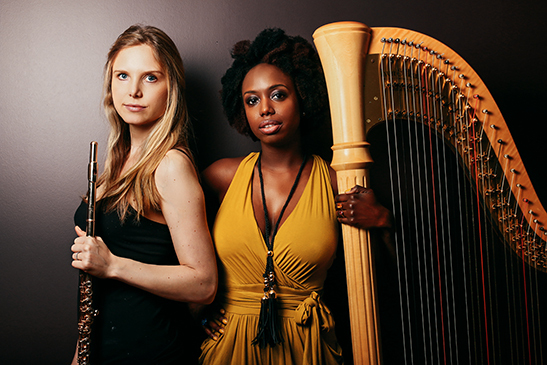 A classically train­ed harpist, New York native Brandee Younger is a graduate of the prestigious Hartt School of Music as well as New York University’s Steinhardt School. Over the past decade, Younger has shared the stage with a host of jazz luminaries including Jack DeJohnette, Charlie Haden, Pharoah Sanders and particularly Ravi Coltrane, whom she began working with in 2007 to honor his late mother Alice Coltrane. Her debut EP “Prelude” was released in June 2011 to critical acclaim. As a classical musician, Younger has been featured as a soloist with The Harlem Chamber Players and has performed with the Eastern Connecticut Symphony, Waterbury Symphony, Soulful Symphony, Ensemble Du Monde, Camerata New York and the Red Bull Artsehcro, a “non-conformist” orchestra. In hop hop and r&b, Younger has worked with Common, Drake, John Legend and most recently, Lauryn Hill, to name a few. Younger has released two recordings as a leader including the EP “Prelude”, released in 2011 and “Live At The Breeding Ground”, released in 2014.